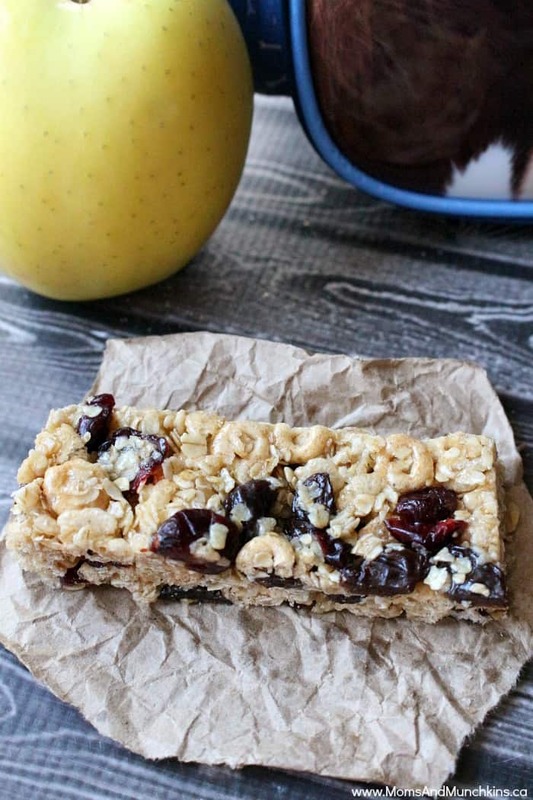 This chewy granola bar recipe is a perfect breakfast-on-the-go or afternoon snack. My son has nut allergies so I didn’t include any nuts in the recipe. 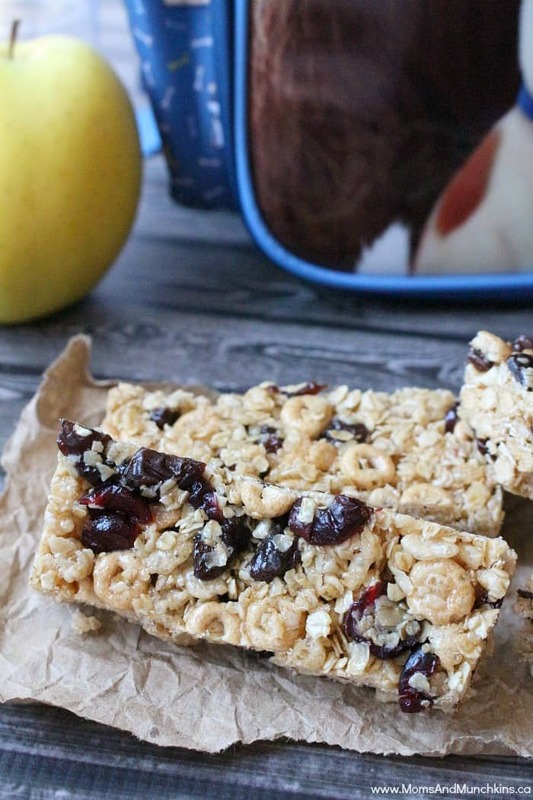 To make them safe for school, I chose Sun-Maid Raisins and Ocean Spray Craisins (both of these items were labeled as nut-free). Something to keep in mind when you’re making nut-free treats for school, never buy items from the bulk bins. If the items are in open bulk bins, they are no longer nut-free as bin scoops get mixed between containers, bins are open beside items containing nuts, etc. If you’re looking for nut-free, buy the actual store-packaged products labeled as nut-free. Since these need time to set, you may want to make them in the evening and leave them covered in plastic wrap in the fridge overnight. Lightly grease a 8 x 8 baking pan. 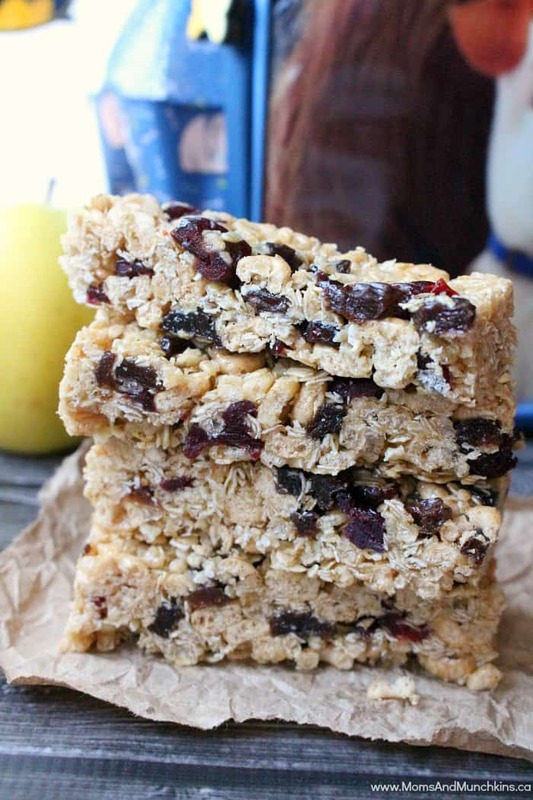 In a large bowl, mix together the oats, Cheerios and Rice Krispies, raisins and Craisins. In a small saucepan, melt the butter, honey and brown sugar together until it begins to bubble. Pour the butter mixture over the cereal mixture and stir well until evenly coated. Pour the mixture into the prepared pan and press down firmly to compact it. Cover with plastic wrap and place in fridge to cool for 2 hours (or until firm). Cut into squares and store in airtight containers. For more delicious recipe ideas, visit our Party Food & Family Recipes page. We’re always adding new ideas. Never miss a delicious update by following us on Facebook, Twitter, Pinterest, and Instagram. These sound so good and I agree they would be much better than what is at the stores!! Thanks for sharing on the Thursday Blog Hop!